Date & start time: Fri / Sat 24th/25th January 2014. 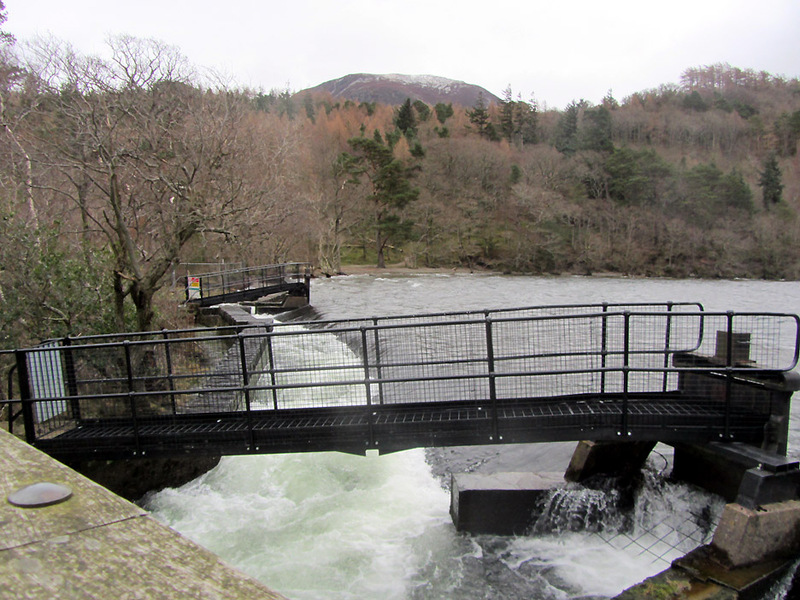 Places visited : Crummock Water and local. Walk details : Smaller, local dog walks in view of the weather. Highest point : Meeting friends for a walk. 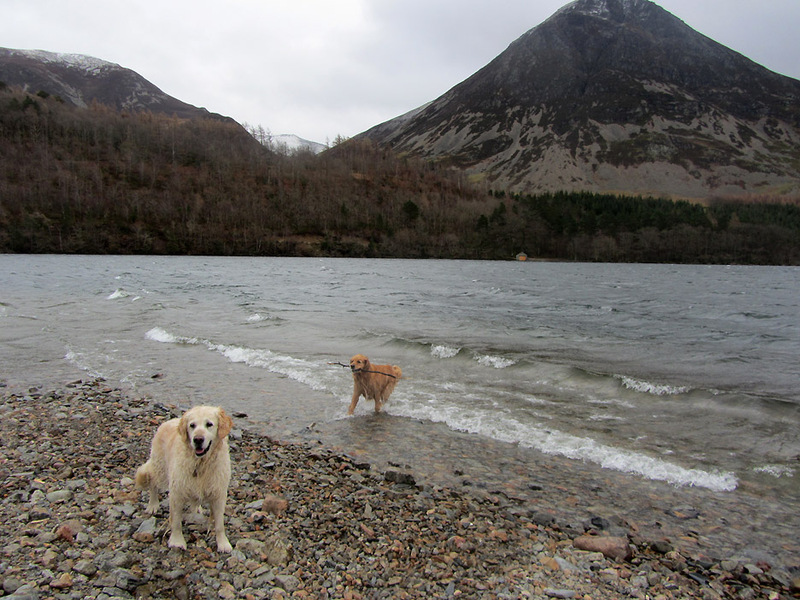 Walked with : Sophie and Ann and the dogs, Harvey, Daisy and our Harry. 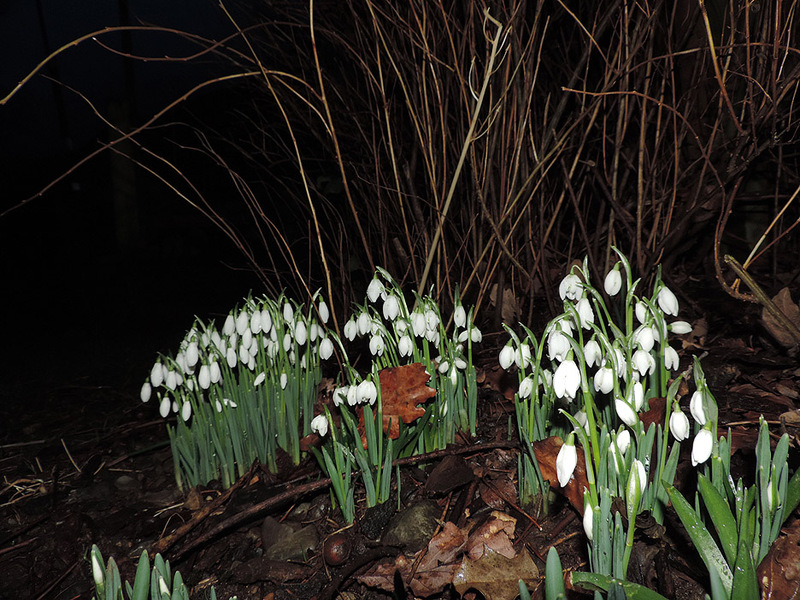 Weather : Grey, hill snow, squally showers at times otherwise breezy but dry. 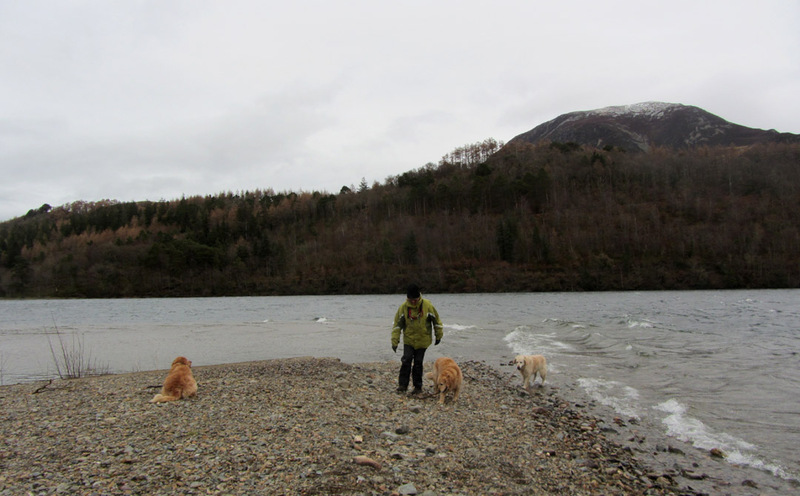 and with that sort of outlook, with work and other commitments, we are strangers to full days out on the fells. Still life goes on and the dog needs and enjoys his walks. taking the air around the village. New bridges rebuilt last year in the same style as the old ones, look like they've been there for years. 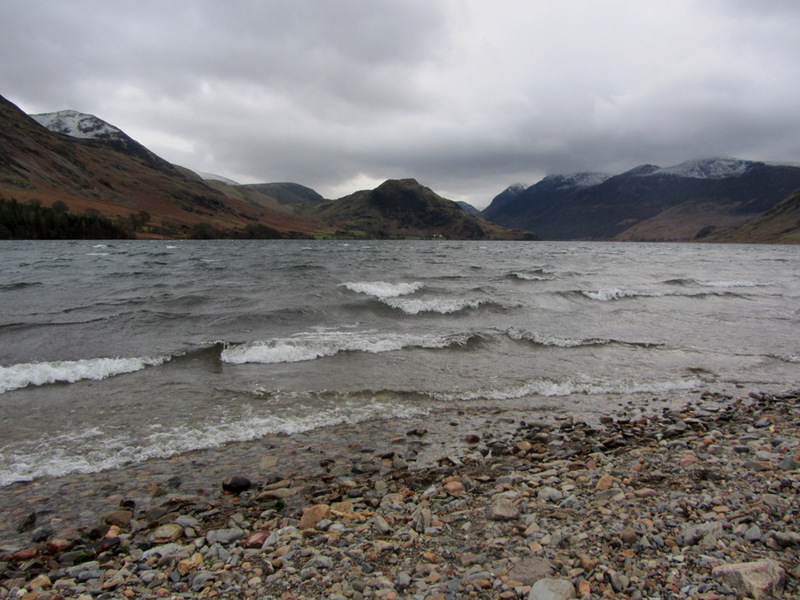 Snow covers the high fells and a steady breeze creates reasonably sized waves, making the lake look cold. 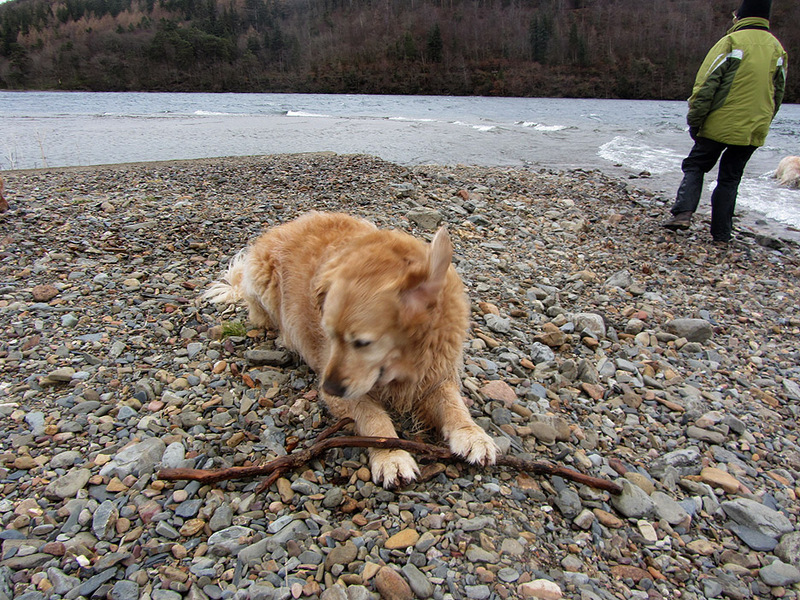 Sophie is wrapped up well against just that breeze as she searches for sticks to throw for the dogs. 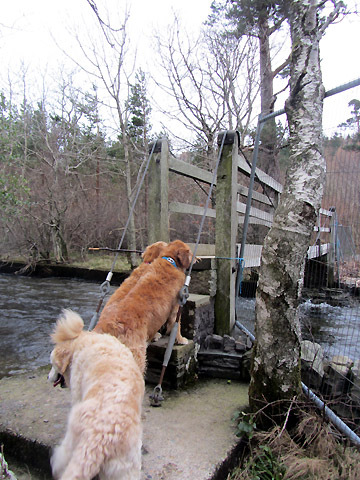 Harvey retrieves one from the lake whilst Harry looks for the next one. Harvey . . . proud as punch. Time for a quick chew . 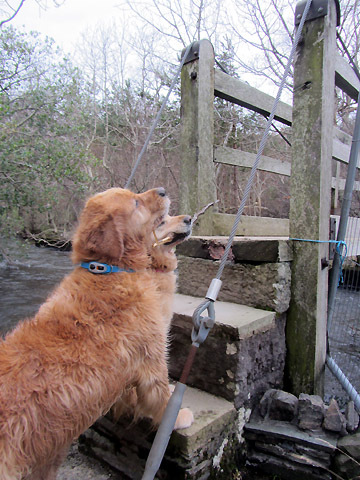 . . even though the wind is blowing straight into his ear. 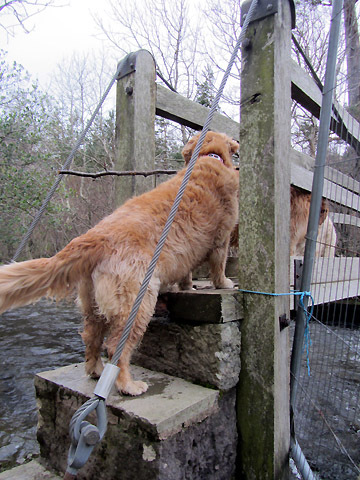 That stick's too wide for the bridge . . .
Give it to me says Daisy . . .
See, that's the way to do it ! and the flood levels are nowhere as high as the south west of England. 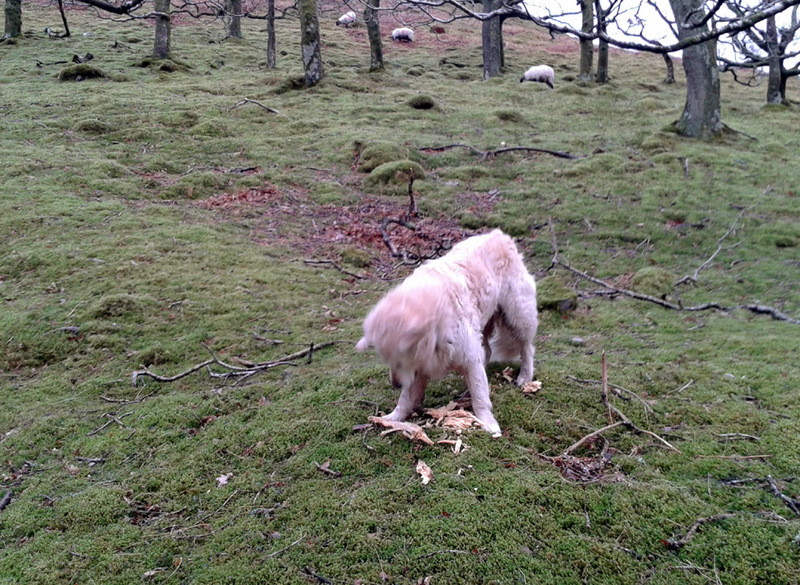 The sheep have eaten their supplementary hay feed and are no doubt looking forward to the farmer's return. 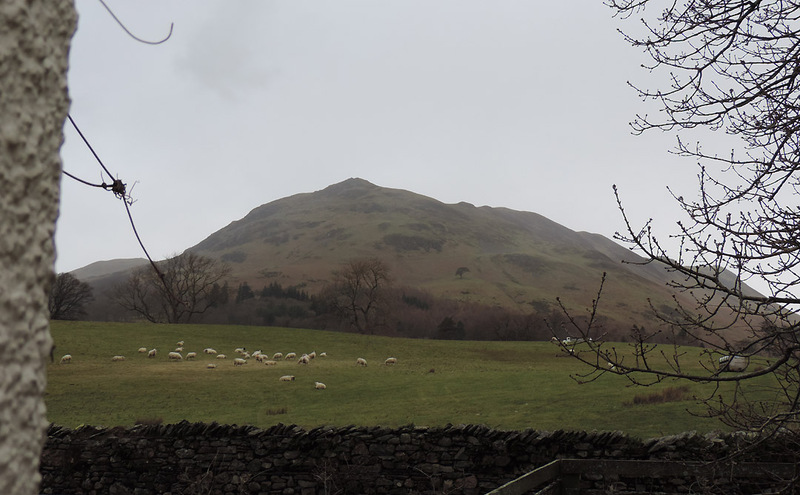 Low Fell dominates the roadside view from the cottage. 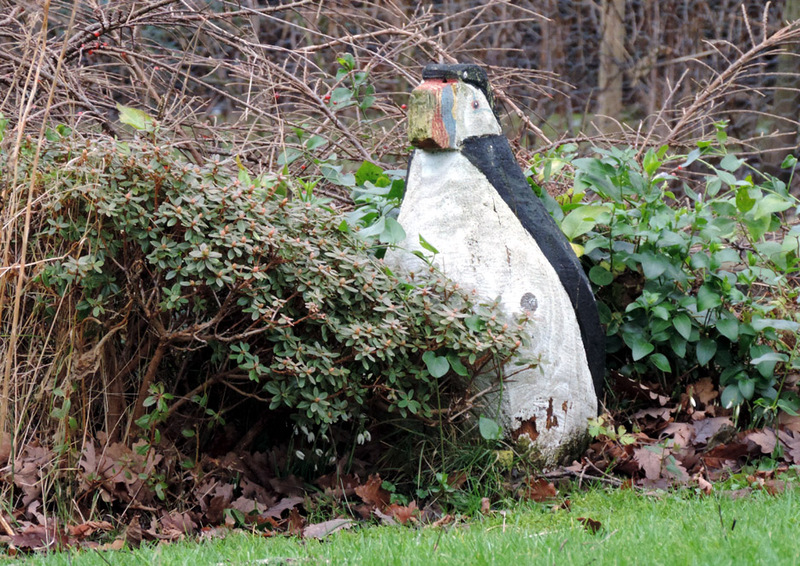 With these low temperatures, our Puffin is thinking of changing to a Penguin ! Over for breakfast . 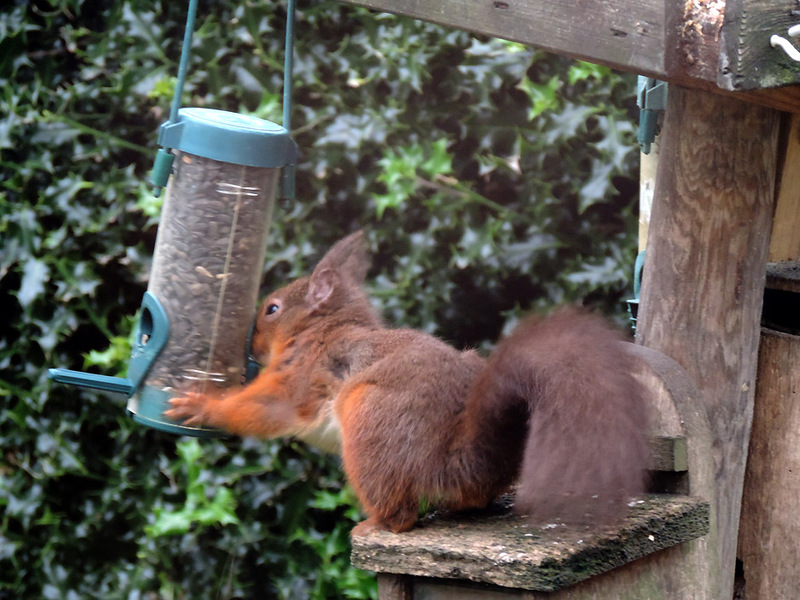 . . one of our two red squirrels . . . this one has the darker tail. 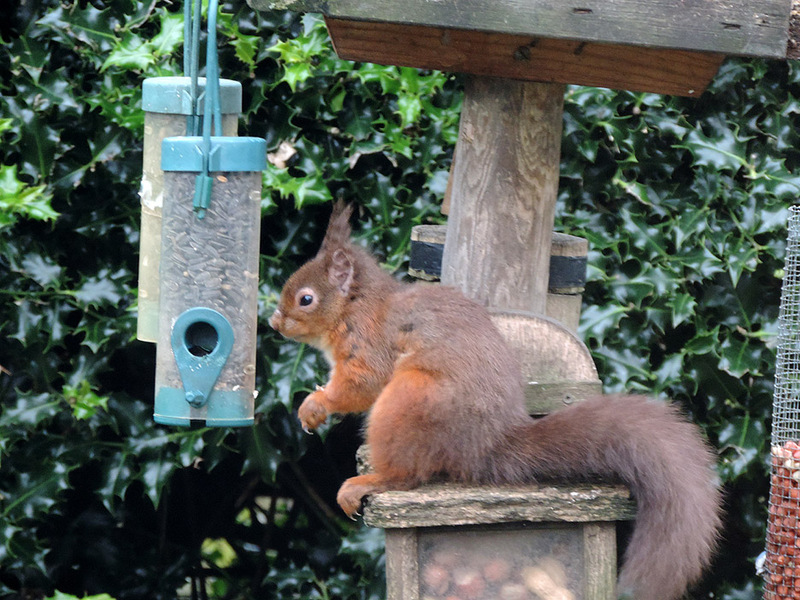 Sitting up for black sunflower seeds in preference to the hazel nuts in the box below him. 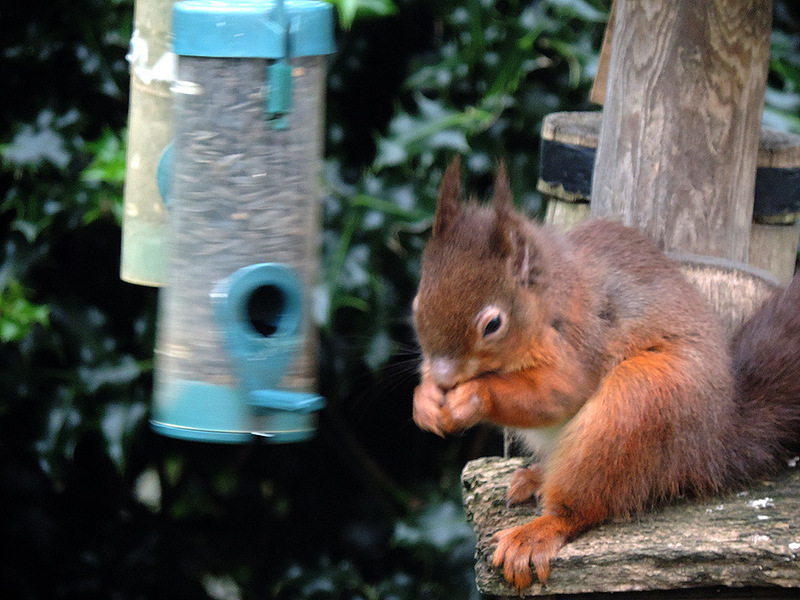 Not one hundred per cent sharp as it was taken through the double glazing. To have opened the window would not only have frightened him away but also make the house cold ! My turn to stroll with Harry and I walk over to Flass Woods underneath Mellbreak's northern flanks. 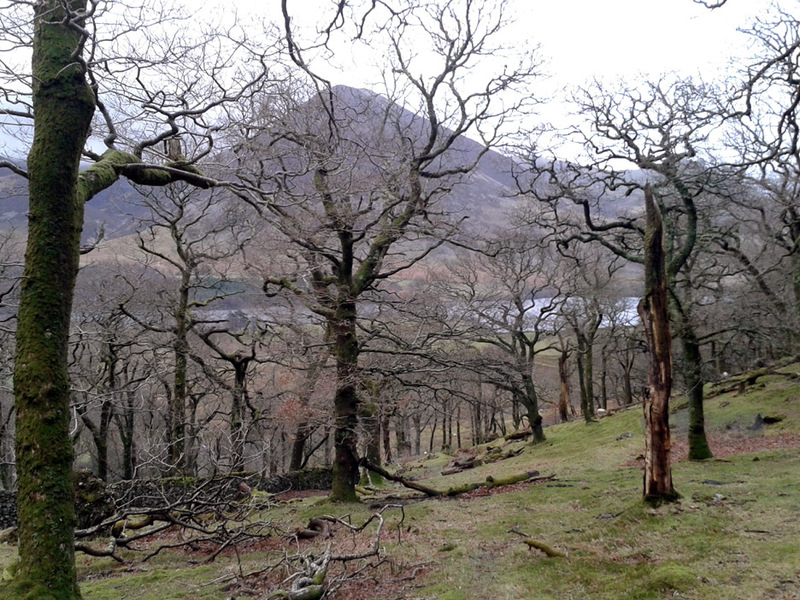 The oak woodland has suffered storm damage over the years but the attempts at re-planting have not been too successful as yet. 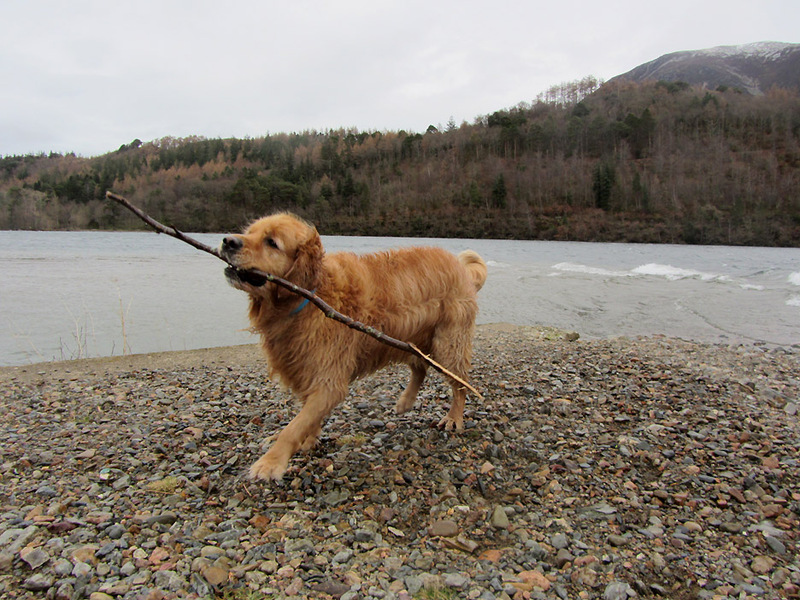 Is that a nice stick Harry ? Hold your cursor over the picture to see his reply. 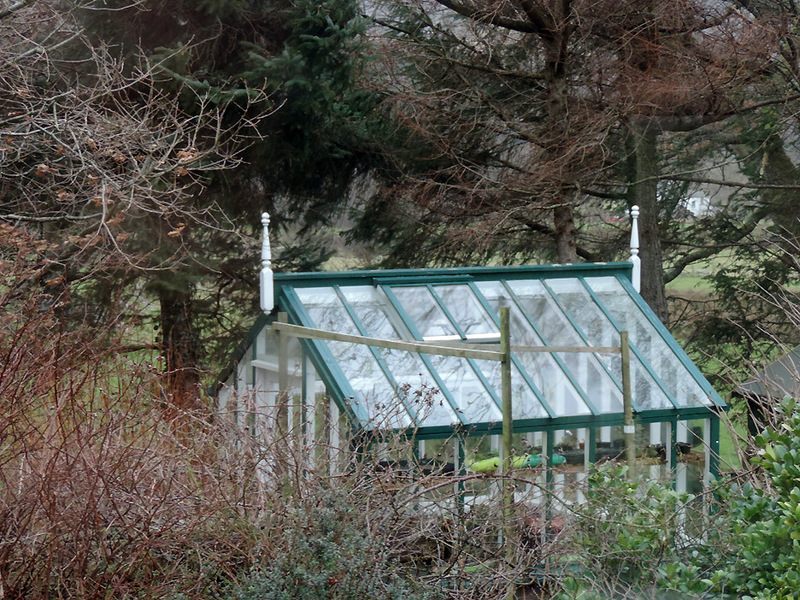 Back in the garden, the greenhouse is looking rather neglected. In fact it looks like it could do with a touch of paint on the top wood but otherwise it is fine. No chance to do anything constructive in the garden yet . . . it is just too cold in the air and too damp underfoot most days. 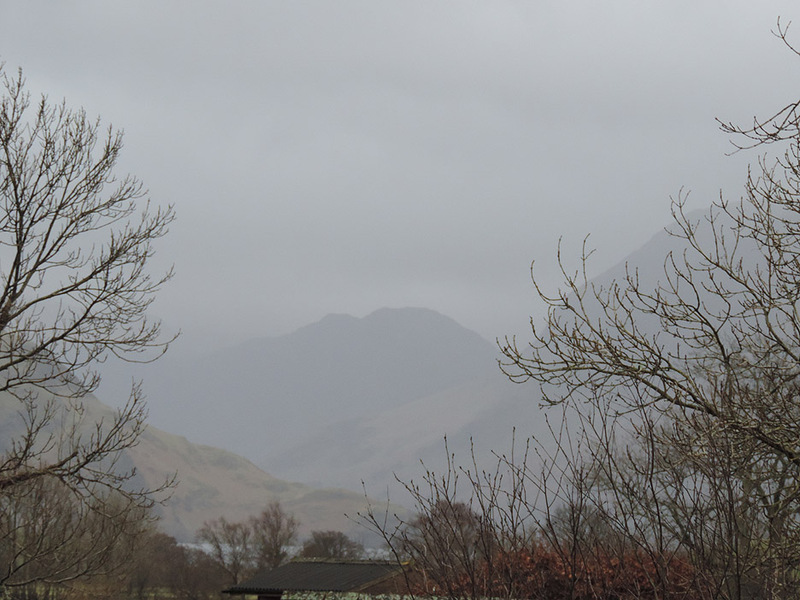 Haystacks from the garden as another winter squall approaches us from up the valley. but poor weather like this always seems to close the day early. 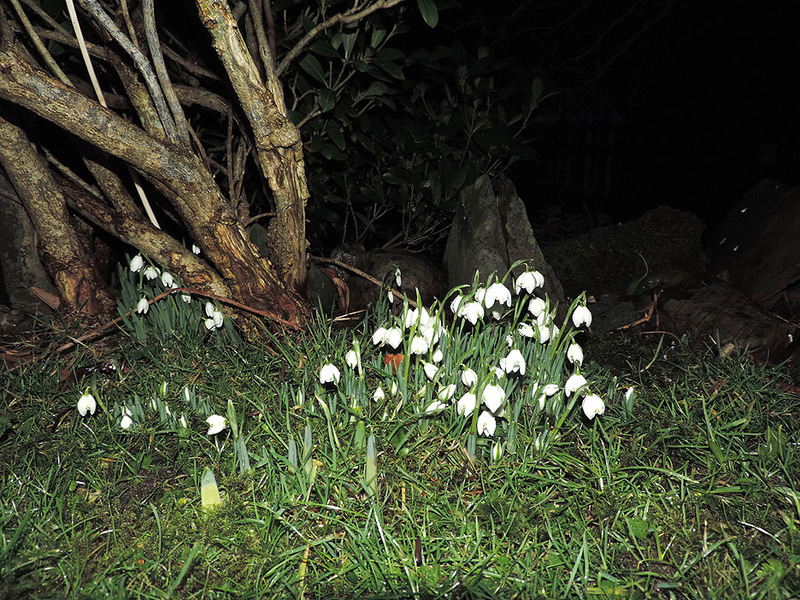 However the new growth of Snowdrops herald another Spring. It has been reasonably mild at times . . . but with these wet and windy conditions, sunny days seem a long way away. Technical note: Pictures taken with either Ann's Canon Sureshot SX220, or my Nikon P520 digital camera. This site best viewed with . . . a log pile full of wood for the fire.